An understanding of the effects of set and drift is vital for coastal sailors; it can make the difference between an enjoyable passage or a struggle to reach your destination against a foul current. As an example, let’s plan a Gulf Stream crossing from Miami to Gun Cay, Bahamas. You know it is safest not to cross the stream in any wind with a northerly component, so you are excited to hear that south-southeast winds will persist for two days at a moderate 10 to 15 knots. Your course to Gun Cay is 114 degrees magnetic, making you confident that you can sail in the predicted 160-degree wind. With no seas, in a boat that points well, you may be correct—were it not for the Gulf Stream. The stream averages 1.5 knots where it intersects the route from Miami to Gun Cay. Depending on the speed of your boat, this may have a significant impact on your course, since the current runs almost perpendicular to your route. In a powerboat the effect of the Gulf Stream is negligible, but in a sailboat, especially one wishing to sail rather than motor, this current can make what at first appears to be a pleasant sail into an impractical and unpleasant experience. Some sailors mistakenly believe that because they have a GPS to tell them what course to steer, they do not need to understand the effects of a current such as the Gulf Stream. This is simply not true. While your GPS will indeed display the straight line between you and your destination, it will not predict the effects of set and drift, which can change a favorable wind direction into a headwind. Never forget that a GPS is reactive, telling you how to correct your heading to stay on course. This means that at the beginning and end of your passage, you will be sailing the predicted heading. However, in the middle of the stream, where the drift is strongest, you will have to point further and further into the current in order to remain on your rhumb line. Such a drastic change in your heading also brings the wind further forward so that you will be beating into it and, eventually, motorsailing. Not only does this eliminate the sailing option, it can also make for a less pleasant crossing. By being able to predict the current’s effect, you can choose a weather window that allows for an easy Gulf Stream crossing under sail. You can use set and drift to plot the course you should steer to arrive at your destination on a more consistent heading, spreading out the effects of the stream across the entire passage, rather than simply reacting to it when it is at its greatest. 1. Find the distance to your destination in nautical miles. 2. Divide this distance by your average speed in knots. (Using your average speed is important. We all like to think our boats sail faster than they really do, so it is important that you be honest here.) This gives you the length of time of your passage. 3. Multiply this time by the average speed (drift) of the current. 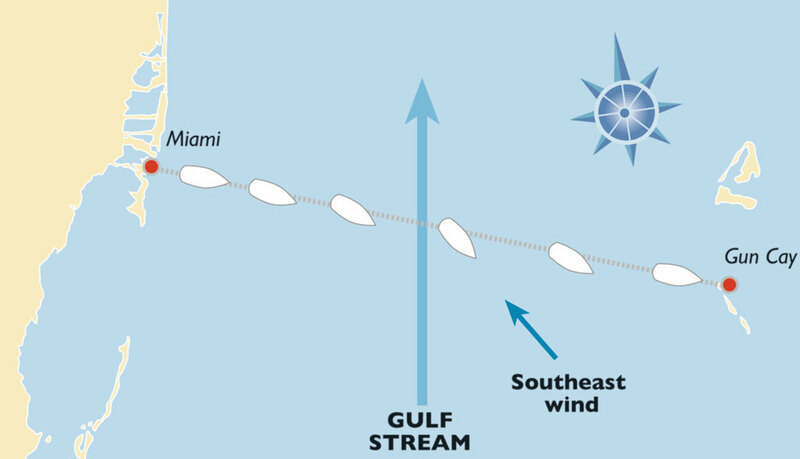 (The Gulf Stream averages 1.5 knots across this Miami-to-Gun Cay route.) This gives you the number of nautical miles in the direction of the current that you would be swept if you did not correct at all. 4. From your destination, plot the set of the current. 5. From your destination, measure the distance you found in Step 3 along the line you plotted in Step 4, in the opposite direction of the current. This gives you a point to use to find your course to steer. 6. Measure the bearing from your departure point to the point you found in Step 5. This is your course to steer. By following this method, the bow of the boat will be pointing in the heading you found in Step 6, but the current will sweep you along the line that takes you to your original destination. Let’s look at the numbers for the Miami to Gun Cay example. 1. Distance: Miami to Gun Cay is 47 nm. 2. 47 divided by our average boat speed of 4.5 k equals 10.44 hours. 3. 10.44 hours times 1.5 knots of current equals 15.67 nm. 4. Plot the current at 18 degrees through Gun Cay. 5. From Gun Cay, measure 15.67 nm in the direction opposite the current: 198 degrees. 6. Determine the course from Miami to this new point. 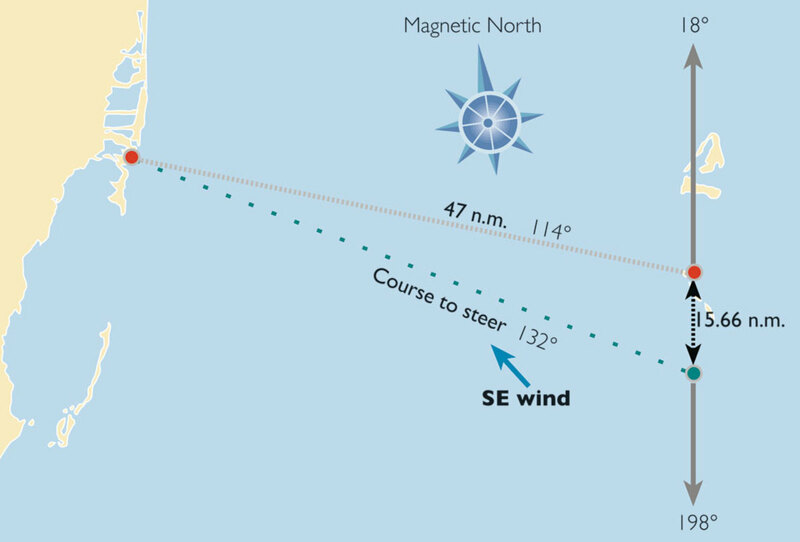 The course to steer is 132 degrees, though the bearing to Gun Cay is actually 114 degrees. With the wind coming from 160 degrees, it now becomes apparent that it is impossible to sail to Gun Cay. 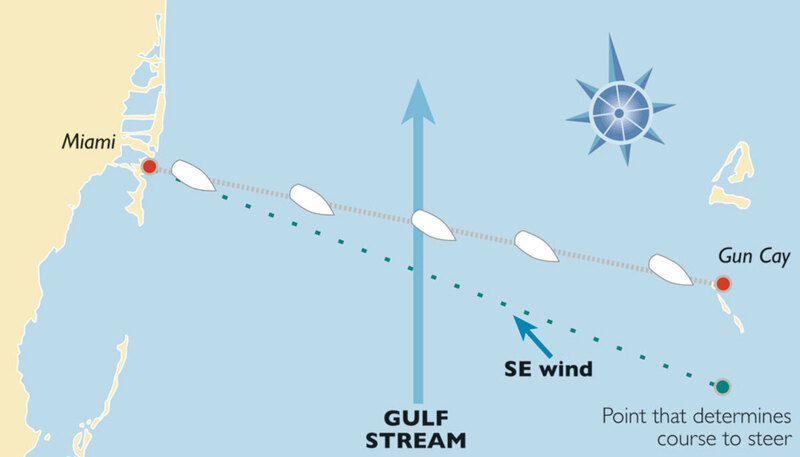 You will have to wait for a more southerly wind in order to sail across the Gulf Stream between these two points. The other option is to depart Florida at a point farther south. But be sure to calculate the set and drift and determine your new course to steer, which will differ for every location.